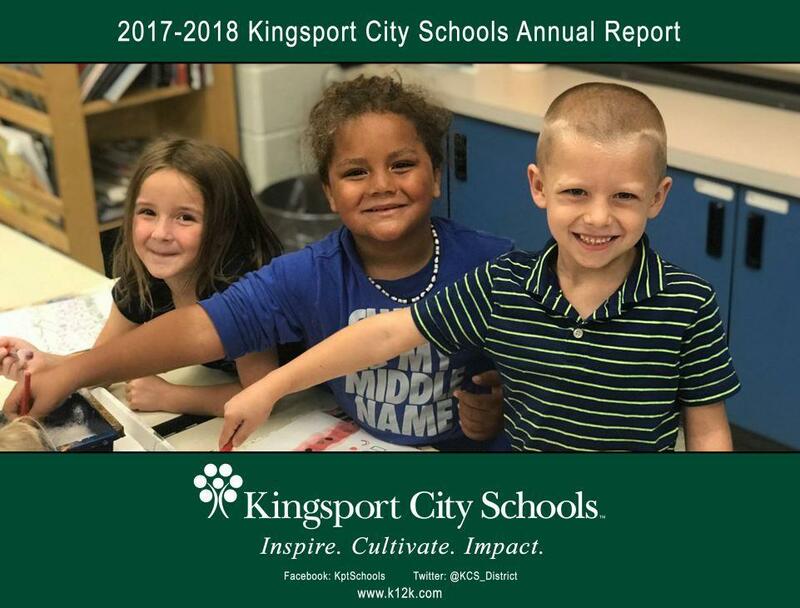 An update on the soon-to-be-released 2017-18 KCS Annual Report. School board members determine a vision for education, design a structure to achieve that vision, assure schools are accountable to the local community, and advocate for continuous improvement in student learning. Board members attend many meetings and school functions, review reports, agendas, proposals and other information, and make a variety of difficult decisions. School Board Appreciation Week is a chance for the community to thank these individuals for their unselfish giving of time and service to Kingsport students, families, and educators. To honor KCS Board members who donate their time and efforts to ensure Kingsport students have a world-class education, Board members were presented a gift bag of various KCS and Kingsport items. Additionally, a book will be presented to each KCS school for placement in their school library on behalf of the Board. Johnson Elementary School Principal Dr. Stacy Edwards and Mrs. Ashley Hill, Johnson PTO President, provided an update on the Johnson Castle Playground community build, scheduled for March 5-10, 2019. The project, inspired by the suggested design of Johnson students, will incorporate a wide variety of play structures and elements. Created by Play by Design, Inc., the structure will pay homage to the original castle playground constructed over 25 years ago. The new castle will be constructed by volunteers over a six-day period in March. A variety of volunteer service opportunities are available, and community members are encouraged to participate. 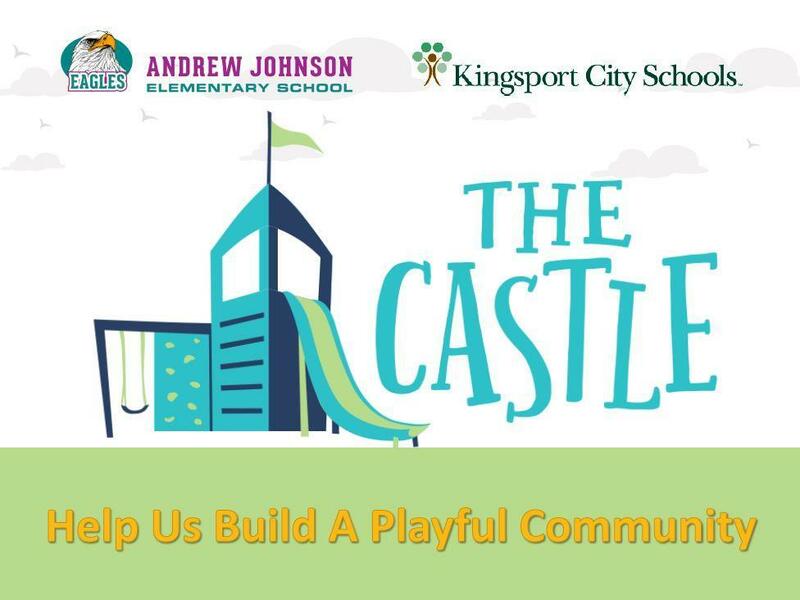 Visit www.castleofkingsport.com for more information on the project, specific service opportunities, and to sign up to volunteer. Assistant Superintendent - Administration Mr. Andy True and Communications Editor Mrs. Marybeth McLain presented an update on the district's communications efforts. The KCS Communications Department facilitates a wide variety of projects and services with the mission of striving to engage KCS families and the community in all that is done throughout Kingsport City Schools. The department produces a variety of print and digital publications, engages in internal and external district marketing, plans and facilitates events, leads crisis communications and management, and promotes the brand and work of KCS students and staff. A focus on communications research and development is a priority, seeking new and innovative way to connect KCS to the stakeholder community. In addition to internal and external communications support, the department leads the district's web and social media efforts. Click here to view tonight's full presentation. To conclude tonight's communications presentation, Mr. True and Mrs. McLain revealed the cover of the 2017-18 KCS Annual Report, currently in production. The Annual Report will again take the form of a descriptive calendar, highlighting the projects and programs of KCS. The report will be mailed to KCS homes once publishing is completed. The next regular meeting of the Board of Education will be on Tuesday, February 12, 2019 at 6 p.m. The meeting will take place in the Tennessee Room of the Administrative Support Center (400 Clinchfield Street). Read and follow our blog, "We Are KCS" to learn more about the great people and programs of Kingsport City Schools. Check it out at WeAreKCS.com.